an unexpected or astonishing event, fact, or thing. Volume going in and out: With one pair, I constantly had connection issues with my iPhone and there is nothing worse then dealing with something like this when on a long run! Falling out of my ear: one pair, even with the over the ear holders, still would pop out of my ear leaving me once again trying to pop them back in and disrupting the rhythm of my run! Low quality sound: Somewhat related to the first note, quality of sound was normally poor so that would ruin the given run as well! Flapping strap: I tried various ways to combat this (notably tucking it into my shirt for one) but more often than not, the strap connecting the two headphones would bounce around which was just annoying! These problems painted the “Bluez 2” in a negative light before I even recieved them! But once putting this device on, a week before my first marathon about four weeks ago, those issues all disappeared! My experience with the Bluez 2 had been very good. Yes, I did have an issue with the first pair that just stopped working a week ago but the folks at Aftershokz responded to my inquiry quickly and sent me a new pair via express mail! Since they arrived late last week, I have tried the new pair three times and so far so good. 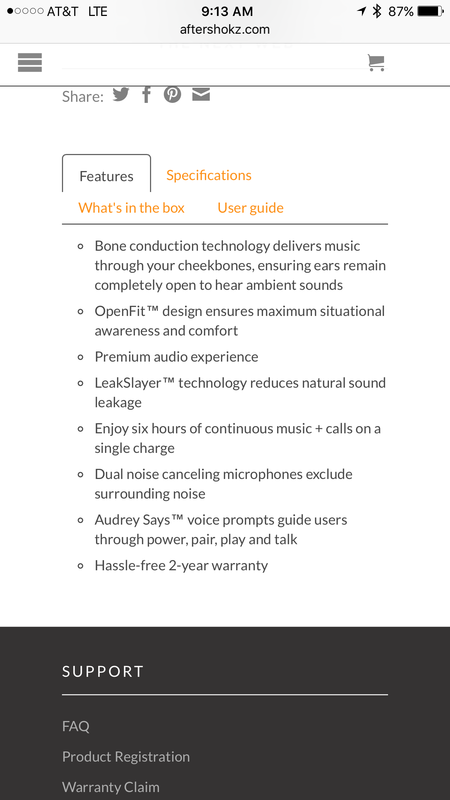 Before going into the pros and cons, here is a description of the Bluez 2 from Aftershokz pulled directly from their website. Good Sound! 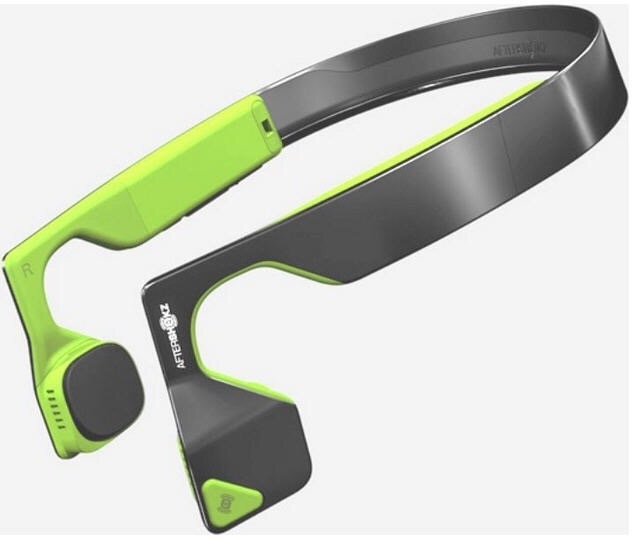 I was skeptical of this “jaw bone tech” but after using the Bluez 2, that skeptism has vanished! Being a “newbie” to such tech, the sound is clear from its position on my jaw. Further, even in the loudest of traffic, I still hear most of sounds (even quiet books from audible). This allows me to maintain focus on my run and at the same time, remain safe (as I hear cars or bikes coming up behind me in the city and other places I run). Solid around the ears: This device is rock solid (almost too rock solid) around the ears. No matter how much I sweat or shake for that matter, they do not budge. And with their position (i.e. not in the ear), there is no sliding of the ear pieces (like in ear headphones) that leads to a change in sound quality. The Bluez remain solidly in place for hours at a time (they were in my head for 4.5 hours during the marathon run in mid May). Bluetooth connection easy: Setting up the connection to my iPhone was simple and easy. Hold the power button down to turn them on. Then keep holding the button down till “Audrey”says something about Bluetooth…then confirm on the iPhone side under Bluetooth > settings and you are connected! Took all of 45 seconds to complete which is nice when one just wants to get out and run! Easy to turn on and off: This relates to the previous comment somewhat as on and off is simple…just hold the button till it vibrates for on and off! Easy control of sounds via device: Sound control is easy. To turn something on or off, just press the button on the ear piece. It seems to have a delay though I think that relates to the Bluetooth connection with my iPhone. Safety First! The jawbone technology has been a lifesaver for me – literally. The other day, I heard a car coming up behind me and was able to adjust accordingly. Last week, the same thing happened while wearing in ear yurbuds and I had NO IDEA the car was coming up behind me. This difference is super important and I would imagine to others as well. This is worth the consideration alone! Battery not long lasting: Now, for whatever reason, I have unreasonable expectations for any device and battery power so this is probably more of a bias of mine than anything. The headphones give me six hours easily of time but overnight, if not plugged in, lose power. Now I haven’t actually tested this so it is more anecdotal. I will try to test this in my Followup to this review though. Is 6 hours long lasting? Yes. But for me, I am a bit picky so not enough? Uncomfortable around ears on very long runs: I noticed this when the aforementioned marathon. The Bluez 2 started to hurt a tad around the 3.5 hour mark. Nothing painful really but it was “felt”nonetheless as the headphones weere too tight around the top of my ear. I have noticed this around other runs as well but it is not a regular occurance which has me wondering what exactly is the problem. More research needed! Not particularly “compact”: The one “problem” that I have with the device is that it is not compact and does not simply fit into a pocket. Also the Bluez 2 do not come with a carrying case which makes it susceptible to damage. I took particular care of the device placing it in a safe place in my bag but if I did not have a bag, I would find myself carrying the device. Volume hard to navigate and power plug “tough” to manage:This is not an big issue but I found the placement of the volume button in a tough place near the power button. Not a big issue because I can control volume via my iPhone but if I am keeping the phone in a belt, it becomes more difficult to turn the volume up and down. As for the power button, the plug is a struggle in and out of the slot. This is less of a case on the replacement one but still not easy. Wondering if this is what caused the power problem before and requires a replacement device as a result? My Rating: I like them! So in the end, I really like this device. Now here comes the disclaimer: I have not tried every wireless headphone device in the business but I have tried more than a few so there could be another one out there that is better but at the moment, I have not tested it SO the Bluez 2 are my choice for wireless headphones. Given the price point relative to others, I like it as an option for runners and for me! Now, with that said, I have just recieved the Aftershokz Trek Titanium to test. The Trek’s are a different animal of sorts and I will report back in a few weeks with an update! Till then, thanks fo reading! Previous Post TR: Not “Shokz’d by their Service & blister banter! Next Post Questioning my Aches and Pains…is it the shoes or PsA? Pingback: Taking in some Luvo! Pingback: 5 for Friday: Trails, testing and Soccer!